Le dunk de la mortAs a culture, although Americans say we love teamwork and loathe selfish players, in reality we tend to dismiss the value of teamwork, and drool over talented and flashy players, even if they are somewhat selfish. 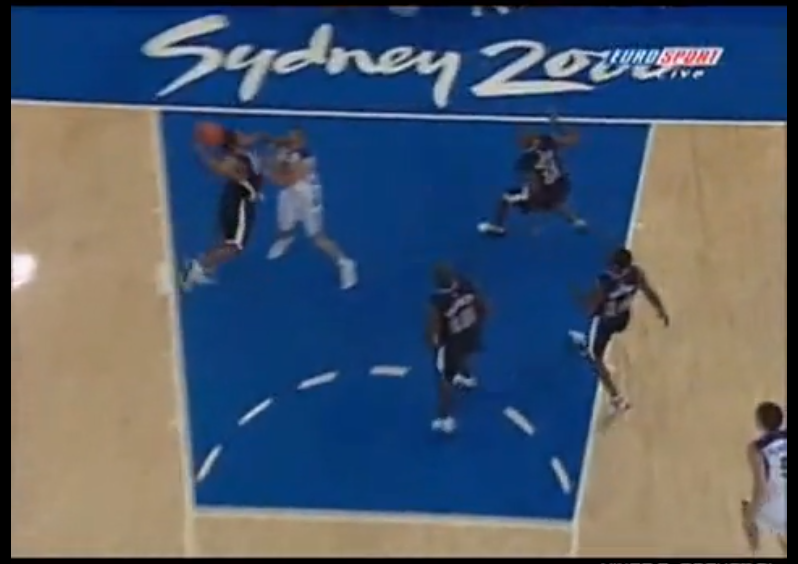 If for some reason you couldn’t see the clip, it is a replay of what the French media dubbed, “le dunk de la mort” (the dunk of death) — Team USA player Vince Carter jumped completely over France’s 7’2″ center, Frédéric Weis, and dunked the ball on the way down. a. The play starts with defense (a steal by Vince Carter). b. It is just astounding to see someone in normal game flow jump over a 7’2″ guy and dunk. c. An unnecessarily fancy pass was the true beginning of France’s embarrassment on that play. Other than the blurriness, what’s wrong with this picture?! Kevin Garnett, Vin Baker and Gary Payton are all open near the basket, yet Vince Carter risked an offensive foul and a turnover by taking it right at Weis himself rather than passing to an open teammate. Granted, given how it turned out, it really is hard to fault Carter for not passing in this instance, but it is an interesting decision, isn’t it? Don’t get me wrong — like I said, I both love and hate this clip — but pretty much 100% of the American basketball community has probably never thought to see this play as anything other than mind blowing. For some reason it’s never occurred to most of us that in reality, this might have been a very selfish decision that just happened work out really really well! There is another decision to be observed in that clip. After the made basket, Gary Payton and Vin Baker turned and ran back to play defense. 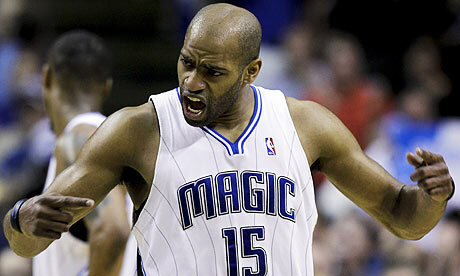 Vince Carter and Kevin Garnett, on the other hand, stayed back to flex their muscles at each other and scream. Vince Carter’s decisions are even more interesting if you look at them in their historic context. Looking back at 2000’s Team USA, this team is now considered to be the beginning of the end of USA’s dominance in international basketball. The Talent Myth ExposedFor as shocking as Vince Carter’s dunk was, the world was even more stunned when in the quarterfinals this team barely managed a 2-point victory over Lithuania, a country about the size of the state of Missouri, and who at the time had no NBA players! Nevertheless, that game came down to the very last shot, a missed 3-pointer at the buzzer by Sarunas Jasikevicius. In fact, the world was so astonished that NBC, knowing it now had a market for it, changed its worldwide broadcast plans for the gold medal game, broadcasting it live on Saturday night (2 p.m. Sydney time) instead of by tape delay during prime time on Sunday as planned. For the first time since using NBA players, despite their colossal advantage in player talent, Team USA could not dominate it’s opponents anymore, and the world knew it. And the scores started to reflect it as the 2000 USA Men’s Basketball Team was no longer beating teams by double digits. Vince Carter leaping over a player? Yep, that’s big time talent. Team USA needing luck to pull out a win against a country with a population about that of the state of Connecticut? That’s just wrong, but for some reason, the United States wrote it off as a fluke and ignored the warning signs. The 2000 USA Men’s Basketball team had just officially given the basketball world it’s clearest-ever evidence of the power of teamwork — even against laughably superior talent. Winning the gold medal in 2000 was the worst thing that could happen to the USA men’s basketball, because rather than come to terms with the fact that talent can be trumped by teamwork, the United States proudly chose instead to live in denial. Consequently, in 2002, Team USA would “take its talents to” Indianapolis, Indiana for the 2002 FIBA World Championship, and lose to Argentina, Serbia and Spain, and finish a humiliating 6th place, despite having home court advantage. You would think that would wake Americans up to the importance of teamwork, but no. Unbelievably, Americans were still in denial of the importance of teamwork, and rationalized that the problem was that USA did not put its best players on the court in 2002. Only to lose to Puerto Rico, an island about a third the size of the state of Hawaii. And USA didn’t just lose, it lost by 19 points, the largest margin of defeat ever for USA basketball in international competition, including before it used NBA players! Two more losses would follow, and America would have to settle for the bronze medal. No matter how strong each of your 5 fingers are, they will never be able to make as powerful an impact individually as a slap, as they will together as one fist. But just because USA Basketball Director Jerry Colangelo and Head Coach Mike Krzyzewsk gave more than just lip service to the value of teamwork, it doesn’t mean all Americans get it now as well. In fact, basketball at every level in America still tends to think in terms of talent, rather than teamwork. If you don’t believe it, just look at the expert predictions on ESPN.com for who they thought would become the 2011 NBA Champions. Clearly we are all still looking at talent (Miami Heat, Los Angeles Lakers, Boston Celtics) and overlooking the contribution of teamwork, the hallmark of the eventual 2011 NBA Champions, the Dallas Mavericks. I hope that someday the American basketball community will learn to drool as much over a player’s team-oriented mindset as we do his athleticism, size and talent. In the meantime, we Guardians of the Game need to teach the rising generation the value of teamwork, and drive it deep into their DNA by having them play in a system that inherently requires and rewards them for playing as a team. One of those systems is the Read and React Offense. The mandatory spacing and player movement required with passing the basketball in the Read and React Offense makes Read and React an excellent system for teaching players how to play unselfish, team-first basketball. 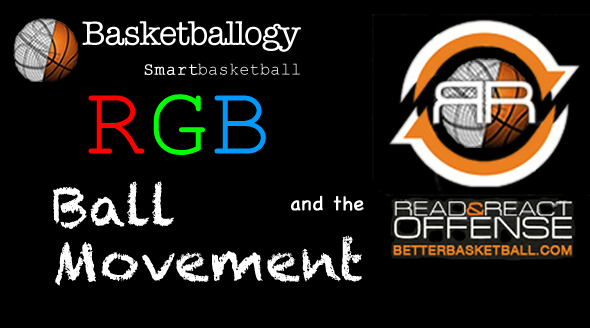 In RGB part 1, we agreed that the “red, green, blue” core principles of all half court offense are: spacing, player movement and ball movement. In RGB part 2, we established that the core principle of spacing is to make life more difficult for defenders. In RGB part 3, we revealed that the core principle of player movement on a dribble drive is for teammates to place themselves in a passing window while the drive is taking place. Well, in RGB part 4, the core principle of player movement when passing is that passing is about giving back to the team for trusting you with the ball in the first place. As you know, 90% of the game of basketball is played without the basketball in your hands, so if you have the ball, it is because your teammates trusted you to have it at that time and in that place, so when you pass it to another, you need to give back to your team for their trust in you. How do you do give back to your team after you pass the ball? 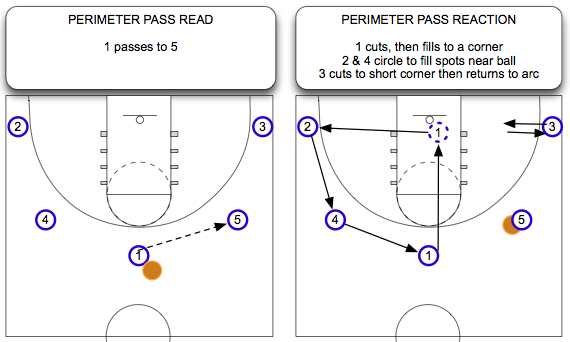 Pass, cut to the basket, then fill a corner position along the arc. Pass, cut, then take a post position around the key, or a short corner. Pass, then cut to set a screen off the ball to free up a teammate. Pass, cut, then return to the ball handler to execute a pick and roll. If a skip pass has been made, the players stay put, although if the passer forgets and cuts, everyone knows what to do and it’s fine. If a player passes and cuts, his teammates need to remember that the positions nearest the ball always need to be filled, so they will need to circle rotate to fill them (see illustration below). If you pass to a post player, preserve good spacing by making your cut over a post spot near the ball handler (see illustration below). The AnimationIn the Read and React Offense, every pass triggers player movement, which means that a team that passes a lot, also has a ton of player movement, and great spacing… and is just a nightmare to defend. To get a better idea of what the player movement on perimeter passing should look like, study the animation below. Clicking “Next” gets the movement started. To make sure our team is thinking pass first, I teach my players that half court offense, like dance music, has a rhythm to it, and something has to happen at least every 4 counts. Some players will pass, but only after they’ve “enjoyed” having the ball a bit first. They’ll jab step, juke, fake, or worse, meander dribble about the floor, sometimes pulling moves so they can be amused at the defense’s response. It’s been my experience that players who see nothing wrong with doing this will argue with you if you tell them that they are killing the rhythm and flow of the offense. Since I don’t argue, I remedy the situation with a combination of Basketballogy Scrimmages and by video recording games and some scrimmages. While watching the video playback with the team, I sometimes count out loud the passes per possession, and then count out how many seconds these players dominate the ball when they get it. In this setting, it is pretty hard for them not to see it when we are all watching it together on a 70-inch, high definition TV. I also tell my players not to wait until they have the ball to decide what they will do with it. While the ball is in the air, they can be thinking about exploding into an attack, be it shot, pass or dribble, and attack with the advantage of having caught the defense by surprise. The DrillTo practice player reactions to passing, we start simple and build from there. We start with a slow, 5-out passing drill, and let it gain in briskness as the players get used to cutting and filling. Next we run the same drill 4-out, so players can get used to passing with a post player, and the post player can move and set picks for cutters. Then move them on to our favorite “drill.” We set up two half court scrimmages with a highly specialized set of rules designed to instill good playing habits in the players, such as generous ball movement. For example, players are not allowed to dribble more than twice; if they do, it is a turnover. You can read more about the Basketballogy scrimmage here. This scrimmage is so beloved and so powerful that when our team is more familiar with the offense, I actually start off our practices with Basketballogy scrimmages now. Why? Because after playing two or three games while only being allowed to dribble twice, the ball movement and player movement isn’t just fantastic, it’s ingrained in them and is a natural part of the texture of their play the rest of the day. Seriously, the rest of the day in everything else we do, my players are thinking pass first, and dribble minimally. Again, in the Read and React Offense, every pass triggers player movement, making a frequently passing team a very effective half court team. The ways of scoring with a team that spaces, shares the ball and moves like this are pretty much infinite. The Unknown IronyDid you know that in 2004, when USA’s roster of NBA players settled for the Olympic bronze medal, a couple of long standing USA Olympic individual records were broken? Stephon Marbury set a new USA single game scoring record with 31 points, and Allen Iverson set a new record for 3-point shots attempted in a single game with 10 attempts. Even USA’s original “Dream Team” (with Michael Jordan, Larry Bird, Magic Johnson, Scottie Pippen, John Stockton, David Robinson, Charles Barkley, etc.) never had a player score more than 30 points, or huck up so many 3’s — not that anyone believes these players weren’t capable of it had they wanted to. And did you know that in 2008, the USA “Redeem Team” did not break any individual records en route to a gold medal? However, they did manage to lead the entire world in assists per game (18.75) and in assist to turnover ratio (1.36), indicating that as a team, they were sharing and caring for the ball. And on the defensive end of the court, Team USA led the world in field goal defense, and in 3-point field goal defense. Setting the tone for Team USA’s selfless effort, reigning NBA MVP, Kobe Bryant, asked to guard each opponent’s best player. Against Brazil, Bryant faced Leandro Barbosa, the tournament’s scoring leader. In preparation for the match up, Bryant had DVDs made of Leandro Barbosa’s entire offensive repertoire. Bryant studied over 200 of the “Brazilian Blur’s” moves, in games playing both for Brazil and for the Phoenix Suns, and studied shot charts documenting Barbosa’s efficiency at each move. Kobe Bryant’s defense astonished the world, particularly Leandro Barbosa, who was averaging 27 points per game, but manged just 4 points against Team USA (and 2 of those were free throws). Kobe’s focus was clearly on “the 90%,” the part of the game of basketball where the ball wasn’t in his hands. The irony is that the group that put their team’s success ahead of individual accolades, the 2008 “Redeem Team,” has been immortalized in USA basketball history, as have its players for what they accomplished together. By contrast, the individual records of Allen Iverson and Stephon Marbury of the 2004 Team USA were pretty much forgotten the moment Team USA received their bronze medals. I’m not saying that there is no place in basketball for players who are primarily “me-first,” I’m saying that their place is not often first place. Like many coaches, from time to time I have been criticized by parents or players for not having my best players on the floor at a critical moment. They are sure I made a grave mistake — and maybe I did. But in situations like that, I really don’t want my best players on the floor, I want my best team, and unfortunately, some talented players can’t always be depended on to put their team first. Believe it or not, sometimes a coach just doesn’t need a player who can leap over a 7-footer in a single bound, but needs instead a team of willing passers. Of course, the ideal would be to have a player who could hop over a 7-footer when the team needs such a superhuman feat, but won’t if passing the ball is best for the team. Because no matter how strong each of your 5 fingers are, they will never be able to make as powerful an impact individually as a slap, as they will together as one fist. 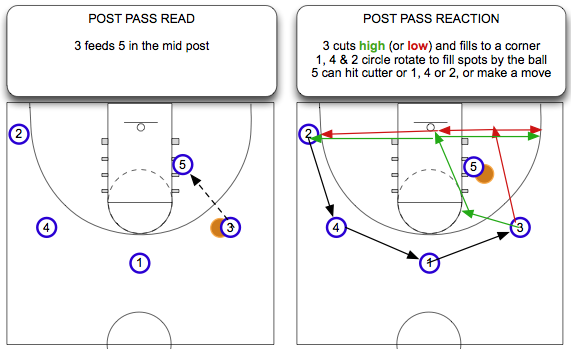 You now have all the background to move on to Teaching the Read and React Offense: the Basketballogy Method (Part 5 of 5). Please finish your thought. Even consider “RGB: Part 6 of 5”! Interesting and informative. Glad it’s that time of year again! I noticed your spacing in 4 out is different than the general Read and React system uses. When you are overloaded on one side, the players appear to be using the “5 out” spacing, and when you are in 4 out middle, they are using the “4 out 1 in” spacing. Is this just an attempt to create equal spacing on the perimeter, rather than to try and have them memorize which locations are 5/3 out, and which are 4 out? Yes, I now use 5-out spacing for 4-out, but it didn’t start off that way. 4-out is our favorite formation, and we used it 3 ways: 4-out center (4-out in the 4-out spots), 4-out left and 4-out right. We found that 4-out left and right (4-out in the 5-out spots) were more effective against zone defenses, which is mostly what we see in our leagues. 4-out from the 5-out spots helped us with zones because ball reversal really caught the defense on their heals, and because we could play with good spacing, ball movement and player movement in an overload and often play 5 on 4 against their zones. Also, I’m a big believer in counter matching a zone formation. If a zone has two defenders in the back court, then I like to form with 3 offensive players on top to push their zone out of its comfort zone. Anyway, in the post season, when we play the winners from other areas, we saw more man so we we used the 4-out spots at first. Then I observed something interesting: the defense switched a lot on screens and often their defense would beat us to our 4-out spots! This ball denial was tough on our ball movement. Then I realized they could do this because they knew we were always forming in the same way every play, all play long. So I had the guys switch back to playing 4-out in the 5-out spots, that way our opponents couldn’t just assume where we would be. In a FLASH a cutter could fill to either corner and convert us from overload left to overload right, and with screens for cutters we could swing the ball and take advantage of that before they even realized what we’d done. Also, I play all my players every game, and each season we have some boys who are still growing into their offensive skills. One of the ways we integrate these players is to have them play the post spots, setting screens for cutters. A player doesn’t have to be tall at all to stop a tall defender from staying with a tall cutter, you know? So against a man offense, playing 4-out in the 5-out spots, a small player in the post freeing up cutters can be quite effective with a team of willing passers. So I’ve stopped teaching 4-out spots now. It makes learning simpler, and I’m confident we’ll be more effective as well. By the way, I finished Part 5 last Saturday, but when I posted it, not all of the html5 animations I’d embedded would work. They worked on their own, but embedding them into WordPress seems to break them randomly. When I find the work around, I’ll get it posted. Thanks for the clarification, that was what I had figured. I have recently scrapped my previous offensive playbook and and philosophy for this system. I didn’t make the decision lightly. I had been groomed on motion offenses like Flex (and flood systems against zone) during my formative years, but in our most recent game the player movement was abysmal, and I have a phenomenal exchange student athlete with no basketball experience who basically can’t play for us in a motion offense, because she doesn’t understand it. She picked up this system instantly, and the movement in practice is astonishing – and the players are excited. It also fits well with our aggressive defensive packages and presses. I think some coaches overlook having a cohesive team gameplan, where they might play a passive zone, but want to run and play fast transition offense. I think its really hard for players at the high school level (and lower) to shift mentality like that. Another benefit I can see to your alternate spacing is improved ball reversals on demand. In practice yesterday we were much more successful getting a ball reversal when we wanted it in ‘3 out’ than in ‘4 out’. A final thought. I have a 6′ power forward with shooting range, and having an offense that allows her to simultaneously play the perimeter and the post is something I’m excited about. I admire you for laying aside what you are familiar with to embrace something new. A lot of guys resist change and try to get results by (figuratively) brow beating their teams, rather than hunt for a system that works better. And I REALLY like what you wrote about having defensive and offensive strategies that compliment each other, and couldn’t agree more. Let me know if you try the Basketballogy Scrimmage and what the outcome was. I’m confident you will find it will improve ball movement even more, and when the ball moves, people move. By the way, one season I had an exchange student from China who was a wonderful player. He had strong, all-around, skills — a rebounding point guard in a power forward frame — but the language barrier was yet another reason to find a simpler way to teach the offense. He was too often out of step with the team, and when he went rogue, everyone did. I literally typed up instructions and rules for him on court, and with the help of Google translate, provided him with “homework” so he’d get what we were doing in practices. BTW, when you have great player and ball movement, there are rarely 4-out when you are playing 4-out… which is another reason to consider 4-out. 3-out, with only 1 or 2 being out in practice can give you poor spacing even though you have great ball and player movement. Anyway, thanks for commenting; I enjoy your insights. Funny thing, I already run a variation of your scrimmage that I created myself. I call it Double Dribble (after my favorite NES basketball game). Its a full court man to man scrimmage with the following rules. 4. First team to 30 points wins. This gets my players to use the pass to move the ball in transition rather than the dribble. It also reinforces the idea that dribbling with purpose is ok – especially when it leads to scoring or advances the ball without a turnover. I’ve also found my post players become more involved in breaking the press (and less timid) because it encourages players to come to the ball instead of running away. My players communicate better offensively with this drill as well. This has become the most intense and competitive drill I use. After reading about your Basketballogy scrimmage I have some ideas on modifying the scoring to take advantage of promoting the same player behavior that you are getting, scoring rebounds for example. Its a great drill, and I’m excited to either add it to my practices or modify my current drill to take advantage of it. Interesting. I’d have a hard time counting dribbles and getting the score right, but that’s because I’m too easily distracted. But I like how you’ve given thought to the behaviors and habits you are encouraging in your practices. BTW, your post reminded me that I use 3 dribbles for the younger kids. I’m going to edit the original article to reflect that. Thanks again for the discussion. @Eric. I’m excited to see how your season goes; please stay in touch. The “About” page has a contact form that sends me an email, and we can email from there on. What your post player does would depend on you and your team on the floor. If he is a true post player who is most likely to grab a rebound, then I’d have him move to another post position after the pass, assuming he shouldn’t repost in the same position to get another look. However, if he isn’t particularly a post player, then I’d have him wait a bit, then fill to a corner on the perimeter, then another cutter from the perimeter can play post for a bit, rotating the post duties among the team. There are three circumstances when we keep the same post player inside. First, when we have someone whose skills just are so much better suited to inside play than perimeter. The third time we use a full-time post player is when we have a player whose skills are far below the rest of the team. I need to put a player like this in a position where he doesn’t hurt the team and can feel good about what he’s doing for his team. This helps him feel good about his contribution as I work on developing him in practices and with homework. Teaching him first what 3 in the key is, and what a moving screen is, I make him a role player inside, setting screens for cutters, rebounding, and boxing out so his teammates can rebound. I encourage him to shoot right away when he grabs an offensive rebound. This gives him shot attempts before he turns the ball over trying to dribble, and sometimes the ball goes in or he gets to the free throw line which are positives as well. If he feels he shouldn’t shoot, I have him look to the BASELINE to pass. When they try passing toward the top, they often turn over the ball and give the opposing team a fast break layup. It’s better for opponents to get the rebound and try to score against our half court defense than for us to get the rebound and give them a fast break layup. One piece of advice. Since you have some time before you’ll be teaching your team, if you have a group of buddies you play ball with, see if they will let you show them the elemental offense and play pickup ball with you by it. I’ve found that if a coach actually PLAYS in the offense he is trying to teach, then he is a MUCH MUCH MUCH better teacher of it. He just understands how much time the players need to form their habits and has the right amount of patience for them. Plus, when you make the reads and cuts yourself, you know what players are thinking as they are trying to execute and those nuances help you guide your players. On Monday night (August 6) at 8 pm Eastern time, the Tribe will have it’s first official Twitter chat. Hopefully this will be the first of many Twitter chats to come. This Monday’s topic will be pre-season prep with the Read & React Offense so get your questions, comments, and resources ready (as long as they’re under 140 characters) and join us. By the way, the #rrtribe hashtag is alive so go ahead and use it in any Read & React related tweets to help us get the word out. And, if you have any questions, tweet us @BtrBasketball or leave a comment at the bottom of this post. What’s a Twitter chat? Read below and watch the short video to find out. #rrtribe will be a real-time, 24/7 discussion available to anyone who is interested in learning more about the Read & React Offense. You may share resources, ask and answer questions, or simply connect with other interesting people that have a passion for the Read & React. The best part about #rrtribe? Whether you are a college coach or a youth coach, whether you’ve run the Read & React since the beginning or you’re looking to put it in for the first time, you’ll have an outlet to connect, collaborate, and discuss ways to improve your knowledge of the Read & React anywhere, anytime. Participating is simple – all you need to do is use #rrtibe anywhere in your tweet. Whether you mention, reply, or have your own thoughts on a subject relating to Read & React, all you need to do is use #rrtribe and your tweet will show in our stream! How do I find #rrtribe? To view every tweet having to do with #rrtribe, all you have to do is search for #rrtribe. From there you may reply, retweet, or favorite anyone who has posted to the #rrtibe stream. Thanks to @Cassella_ for the idea, for the video, and really for making this happen.